How does one turn off technology and turn on life? The truth is we can’t, at least not completely. Technology has become so integrated with day to day living that they seem inseparable. I wouldn’t be communicating with you if it was not for technology. Sunsets are no longer just sunsets, not when we have a smartphone. The sunset is captured and shared on social media. Whoopee! But are we deadening our experiences by turning every moment into pixels? Is the angle of the shot and the ‘likes’ it gets more rewarding than feeling the warmth of the sun and just holding it close to our hearts? As a mother, I worry that my children may never tell the difference between the digital and real world. Suddenly, the television our mothers always warned us about seems like a rather tame beast. Technology cannot be switched off as easily. But we cannot overlook the good technology has done, either. It has brought the world closer; it has turned education into something kids can look forward to with kids’ games that make learning fun and it provides easy access to information. Technology is the classic case of ‘we cannot live with it and we cannot live without it.’ Perhaps we need to tweak it and be happy to live with it but not be consumed by it. Easier said than done, eh? In my family, we try to shut the door on technology for at least an hour every day. This is a lot tougher for my husband and me than it is for the kids. 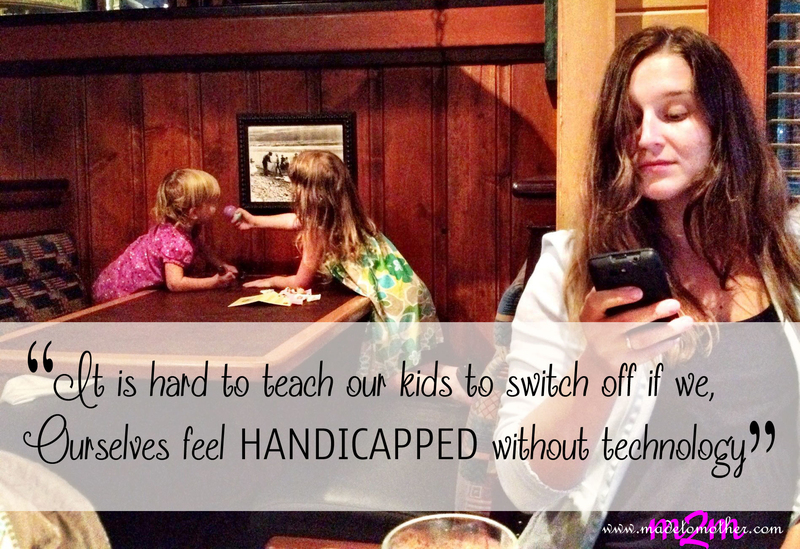 Initially, switching off the cell phone actually made me panicky, thinking I might miss out on an important or emergency call, but it is hard to teach our kids to switch off if we, ourselves feel handicapped without technology. So we make it a rule not to check our phones during meals and it is also off-limits while praying. Going out to play, which was once the most natural thing, is now something we enforce in our home – whether it is bicycling, playing ball or taking a book out to the garden. On the weekends that we take road trips, I resist the urge to keep the kids occupied with mobile apps, and resort to old car games instead, where we can talk. I also turn off GPS and instead ask the kids to read maps and give us directions. It takes more effort and the kids often find this uncool, but I find that creating these technology blank-outs whenever possible is important. This one is harder still, but I try not to document my children’s life in photographs and videos; at least not all the time. When we are at the beach, I want to be there with my kids, not standing outside the frame. Life is not all about people doing exciting things, smiling all the time. I would not want my kids to begin comparing their life with other people’s virtual realities and not face up to what IS reality. There is no rule book to living with technology. I create the rules as we go along. Like they say, the right way is not always the easy way. While it is not an insurmountable issue, it helps to keep in mind that we can either make technology work for us or allow it to consume us. By establishing clear boundaries, we can have the best of both worlds, real and virtual. I appreciate your post…a lot. I am the older generation. My children are grown, but one day I hope to have grandchildren. I can’t even imagine the role technology will play in their lives. I work in a middle school where technology is welcome and encouraged, but not all technology and not all the time. It is difficult to find the right and reasonable balance. Thank you for sharing your thoughts and insights! This is a new problem due to the escalating advancement of technology. yet when our children were small 60 years ago, there was TV that beckoned for them to watch continually. We do need to plan for ourselves and for our children time outdoors and away from gadgets. Thank you for sharing at Tell me a Story. I think one of the hardest for me has been just being in the moment with my kids and not trying to capture everything in a picture. However, it’s when I put down the phone and enter the moment that I really enjoy and experience them the best. I think this post is wonderful! It really spoke to me because this is something we’ve been working on a lot lately. Since I started writing full time it has been harder to step away from the technology. We also have a no electronics rule at dinner, but I love the idea of spreading it out to all the meals. And traditional car games and map reading what a great learning opportunity!! I can’t wait to try some of these tips. Thank you. I too think about this – that I’m setting an example. It helps for me, if we stay communicative about our goals and needs in relation to community and also explain to our kids the whys behind the rules we have in place. Thanks for linking with #SmallWonder. Great post, my children are 5 (going off the Kindergarten in the fall) and 1. My husband and I are already starting the discussion of when to give our kids cell phones. We have decided, for the time being, that until they are old enough to hang out with friends on their own (or at the very earliest walk home from school) they do not need a phone. We are also in talks about trying to get them a “dumbphone” (if they still exist by then) and limiting them to a minutes plan. It’s good to know where you stand ahead of time, and at the same time, sad that you do. We also limit the time on the computer or on a tablet, it’s the same issues that the TV brought on a long time ago, but about 10X’s as hard since technology has crept into about every aspect of our lives. Unless someone gives us a hand-me-down, we try to go old school as much as possible (that’s right CD walkan’s where its at). Our views may change as they get holder, but hopefully for the better. Thank you for posting on such a new, and already controversial, subject. Thank you so much for this post. I so appreciate your thoughtful approach to this touchy topic. I struggle with striking a balance in my home and you’ve really helpful me gain some new perspective. Finding that balance is so hard! I just had to discourage my SIX year old from spending her birthday money on a cheap tablet-type thing displayed at toys r us. It’s just too early for us to start that! Medical problems in children due to overuse of technology are now being reported. Thanks for the informative post on this important topic! Linked up with you at Thursday Favorite Things — hope you’ll stop by Saved by Grace for a visit! Loved this. I am in the same boat with my kids and it’s scary. On one side, I want them to be tech savy so they can keep up in today’s world, but at the same time, I don’t want them controlled by it. It can be a battle when the ipad games seem more fun to the kids than riding a bike and shooting hoops. One thing I’ve learned is, my kids tend to be better about putting away the electronics and playing, if I also put away my electronics and get involved with them. Good points. I prefer to choose to make technology work for me. Thank you for this post (found you on Lets Get Real). We struggle with this too — my son is 3.5 and loves certain shows. I really limit them, but even with limits I feel like they are addicting. some shows more than others. When I noticed that a certain show has taken over his conversations, we take a break from it. Sometimes I think I should cut out TV all together. But there is a push and pull. I don’t know what I’ll do when he is older. Hopefully I would have instilled a love for the outdoors that will help provide the balance. Oh, I LOVE this!! Finding that balance is a huge struggle, and I love that you bring up allowing ourselves to be IN the picture, not on the outside looking in. I couldn’t agree more… I loved this line that says “…comparing their life with other people’s virtual realities and not face up to what IS reality.” This really is the danger all the coming generations face along with the present one. Really glad I visited from #FellowshipFridays! What a great practical post. 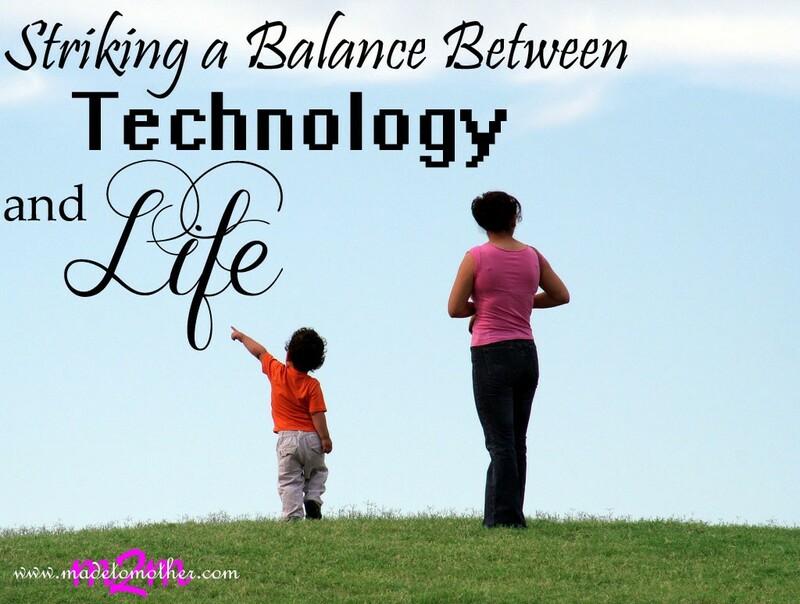 it isn’t just our kids and grandkids who need to find that balance. I find myself having the same struggles. Thanks for for some great suggestions. This is such an important topic to talk about! Thx for linking up this post at the Thoughtful Spot! These are all really great points. Why do we feel like we need to document every moment of our kids’ lives? We have an hour of technology free time every day as well. I try to shoot for more because honestly, I don’t need it. But it is such an addiction! Indeed so very true and hard …to strike a balance. Am hoping to mention this in a blog post and link back to you. Thank you for thought provoking words…. Let’s go outside and connect again with nature.